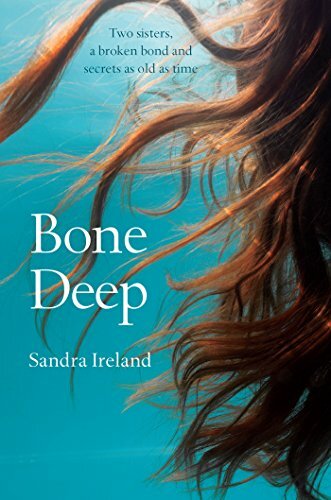 I’m delighted to be one of three blogs kicking off the blogtour for Sandra Ireland’s latest novel, Bone Deep. I’ll be sharing an extract from the novel but first of all, here are my thoughts on the book. The story is told in alternating chapters by Mac, an author writing stories based on local folklore and Lucie her ‘Girl Friday’. Both characters were very intriguing. Lucie has been keeping secrets from her sister. Mac has her own secrets from the past she doesn’t want her only son Arthur, a baker, to find out. The old mill, where Mac’s late husband was the miller, is a central character too and plays an important part in the lives of the characters, and of the local community past and present. There are echoes there of sisters who feature in Mac’s book but are they truly myth or perhaps reality? Their story seems to be an uncomfortable reflection of Lucie’s situation with her own sister. This is a book I was keen to keep reading as I was curious to find out more. It is a captivating read with the characters’ emotions so well written, as well as that vivid setting. It becomes darker the further you are into the book. Bone Deep is a haunting, evocative story. In the night, a baby’s cry wakes me. At least, that’s what it sounds like to me – a thin wail, out there in the black night – and I come out of sleep shaking inside, my heart hammering. I lie in the narrow bed, cold but sweating, eyes straining, trying to place myself in the dark. I see the loom of a strange wardrobe. The air smells unfamiliar. I make out a thin strip of yellow light where the curtains don’t meet, and recognition comes slowly. The security light is on. That’s it, that yellow sliver of light. I lie still, soaking up the heat under the duvet. The noise has stopped, but I can’t settle. I’ll have to get up, investigate. Security lights don’t just come on by themselves. The rug is cold beneath my feet. I can feel the hard ridges of the stone tiles beneath. I root around for my slippers and wish I’d taken the time to unpack my fleecy dressing gown. I’d dug out an oversize T-shirt for sleeping in, and I hug that more tightly around my chest. Flicking on the lamp, the room comes into sharp relief. Not familiar, yet, but normal. The furniture has its own new landscape, and the only thing I’m sure of is my suitcase, now gaping open, with my clothes spilling out. I should have unpacked, but I’d been so tired. Maybe I could do it now? Sleep already feels pretty distant. I might make a cup of tea. The baby starts crying again. It’s outside. Wrenching open my bedroom door, I run down cold passages, skidding to a halt in the kitchen. I can still hear it, a soft sobbing that scrapes at my insides like nails. It’s coming from the back door. Carefully I make my way through the maze of wellies and baskets and boxes, searching for light switches, snapping them on. My breathing is beginning to calm. I’m trying to listen to the rational part of my brain. It isn’t a baby crying. It isn’t a sob. It’s a whine. I find the back-door key and poke it into the lock. I open the door and Floss, Mac’s spaniel, bounces in, wagging her tail like it’s morning and everyone should be up. I make tea. We go back to bed. Floss leaps onto the duvet before I even take my slippers off. I’m too tired to argue. I turn off the light and squeeze myself into the space that’s left. We find a kind of shape; I bend my knees, she spirals into the back of them. Within seconds she starts to snore softly. It’s oddly comforting. Sandra Ireland was born in Yorkshire, lived for many years in Limerick, and is now based in Scotland. She began her writing career as a correspondent on a local newspaper but quickly realised that fiction is much more intriguing than fact. She returned to higher education her 40s, to study for undergraduate and postgraduate degrees at Dundee University. In 2016 she won Creative Scotland funding for a residency at Barry Mill, a National Trust for Scotland property. Her debut novel was Beneath the Skin (Polygon, 2016).